Freeze the milk for couple of hours. Use this to make the smoothie, it comes nice frothy and foamy. If this is not preferred, one can use normal milk. 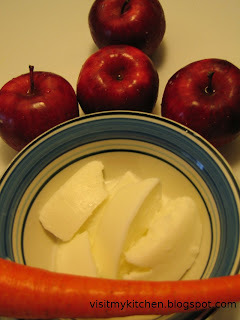 Cut apples and carrots, grind along with milk (or milk + water). Add sugar/honey. Thanks so much for visiting my blog and for the link to this recipe - looks excellent, can't wait to try it!